See any other great buys this week at ShopRite? If you have a deal to share with us...please do so in a comment!! Printable: Free Portriat at The Picture People!! I am so happy to say that before you know it spring will be here!! That means it's almost time for those spring time and Easter pictures to be taken of the kiddies!! There is a coupon here for a FREE 8x10 or 10x13 from the Picture People. Coupon expires 4/4/10, so plenty of time to use. Coupon also give you an additional 20% off additional pictures. If you use Airwick Air Freshener products then you may want to checkout the $15 in coupons they are offering here. You can print them right away. There sre $8.50 worth of coupons for various Arm and Hammer cleaning products here....coupons include savings on Kitty liter, laundry detergent, cleaners, baking soda, and more. You will have to enter your name and email address to access coupons. If you have a Wegmans nearby and are in need of laundry detergent, check out this deal on Arm & Hammer starting this Sunday 2/28. They have the 50 oz Arm & Hammer 2X Concentrate Laundry Detergent in various scents on sale for $1.99 w/shoppers club card. Use the $1/2 printable mentioned above and pay just $1.49 a bottle!! What a deal!! Kraft Mac & Cheese (7.25 oz box) $.79 ea. See any other great buys this week at Acme? If you have a deal to share please leave the details in a comment for us!! 3 Day Sale.....Friday- Sunday Only! Boneless Beef London Broil $1.88 lb. See any other great deals this week at Genuardi's....If you have a deal to share please leave a comment with the details!! Walgreens; Save 54% Off Ink Refills!! Out of ink in the ink cartridge? Uh Oh that means no coupon printing!! Well, I have great news tomorrow , Friday 2/26 Walgreens is offering to refill your print cartridge on the cheap. 54% off the regular price to be exact! All you have to do is grab your cartridge, along with this printable coupon here and head your local Walgreens Photo Center for your refill. You can usually pick up your cartridge in just a few hours....but with this great promo they have going on it may take a bit longer to receive it back. They will let you know when you drop it off, I'm sure! Michael's: Free Make It-Take It Event!!! Looking for something Fun to do this weekend with the kiddies on the cheap? Well, how about heading on over to your local Michael's this Saturday 2/27 to make a Science Fair Make It-Take Craft! This time it is a 3D Molecule Project using Crayola Model Magic. The event is from 10am-1pm. No registration is needed, but it is while supplies last only. Probably best to get there earlier than later to be sure you can take part in the fun!! There is a new printable coupon here for $1.50 off any 2 boxes of Kashi TLC Bars. If you have a Wegmans nearby they are One Sale 2 boxes for just $5.00, now through April 3, 2010. After coupon each box works out to be just $1.50 a box. They have several different varieties and sized boxes to choose from. Building Fun at Lowe's 4 the Kiddies!!! This Saturday,February 27th from 10am-11am Lowe's Home Improvement Stores are holding another Build & Grow Clinic for the kiddies!! This Saturday it is all about building a LoweBot....it's a car and a robot in one!! So Cool!! Tomorrow 2/25, receive a FREE 8x10 print at Walgreens Photo Center!! Simply click here and then take the coupon to your local Walgreen's location to redeem. Remember this coupon is valid for one day only, tomorrow 2/25!!! Limit one offer per customer. Feeling like an nice Italian meal out? Or perhaps you have a gift card to use? Well, here is a printable coupon for Buca di Beppo. Coupon is good for 50% off Off Any Paste or Entree when you purchase one at regular menu price. Coupon expires 3/8/2010. Storytelling Shows at Target...This Saturday!! Have a bit of shopping to do at Target this week? If you plan to have the kiddies in tow, then you may want to plan your shopping trip for this Saturday. Why you ask? Well, Target stores nationwide will be hosting Dr. Suess Storytelling Shows this Saturday 2/27 from 9 to 11 a.m. This event is to support and promote Read Across America!! There will be snacks, activities and, of course, reading one of Dr. Seuss's classic tales "Oh The Places You'll Go". It's free to attend....there is more info here. Plus there are fun printables for the kiddies to print and do here as well. Pay just $1.34 for them! Become a Fan....Get a Free Coffee at Quick Chek! Do you have a Quik Check nearby? Well, if so if you become a fan of them on Facebook here, they will give you a printable coupon for a FREE medium coffee as a Thank You. These are so cute....playing cards on one side, and a cute picture of the kiddies on the other!! How cute is that!! Right now Artscow has a set of Photo Playing Cards for just $2.99 shipped!! Simply enter promo code: PLAY299CARDS at checkout for your discount to be applied. You can get started here. Never heard of Artscow before? I have previously used them on 2 different occasions, both times for photo cards and could not have been happier with the products I ordered!! Are you the parent of a toddler? Or perhaps a baby entering toddlerville real soon? Well, you can sign up here to receive the Beech-Nut email newsletter. As a Thank You for signing up you'll also receive a FREE Beech-Nut Let's Grow Toddler Welcome Kit via snail mail. Your welcome kit will include a Voucher for a FREE Beech Nut Let's Grow Product (up to $3.00 value). Your welcome kit should arrive in 3-5 weeks. Here is the newest coupon Bath & Body Works has out.....receive a FREE Home Fragrance or Signature Collection Body Care item (Up to $12.50) with ANY $15 purchase. Coupon can be used in-store by printing it, or online by entering promo code:FLOWER when checking out. Limit one coupon per customer. Coupon and code expire 3/14/2010. Have a little girl who loves princesses and music? 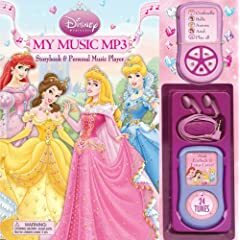 Well, right now Amazon has this cute Disney Princess My Music MP3: Storybook & Personal Music Player marked down from $24.99 to just $10. It ships for free via Super Saver shipping when you spend $25 or more on qualifying items. Easter is just around the corner...perhaps a nice addition to the basket? If you have something to pick up at AC Moore this week, perhaps tomorrow is a good day to do it...especially if it is not a sale item! For tomorrow only, they are offering a coupon for 50% off ANY 1 regular priced item. Simply click here and enter your zip code, and then hit the coupon button...out will print your coupon. Remember this coupon is valid in-store for tomorrow, 2/23 only. There are a few exclusions listed on the coupon....so be sure to read the fine print! FREE Pancake Day at IHOP!!! It's time for FREE Pancake Day at IHOP!!! That's right tomorrow Tuesday Feb 23rd, from 7am-10pm stop into your local IHOP location and receive a FREE (3) pancake buttermilk short stack! All they ask is that you make a small donation to a local children's charity through the Children's Miracle Network. What could be better than enjoying yummy pancakes all while helping out a good cause!! Limit one free short stack per person. Dine-in only at participating IHOP locations. See any other great buys at Shop Rite this week? If you'd like to share a deal...please leave the details in a comment!! Going to Rite Aid...Print This First!! Have a bit of shopping to do at Rite Aid this week? Well, before you head on over, click here to print this great coupon to save $5 off a purchase of $25 or more. Remember this can be matched with manufacture's coupons for even greater savings!! Coupon expires 2/28/2010. If you like Fiber One products there are coupons here to save $2 off various Fiber One products (yogurt, bars, cereal). In need of hand soap? Around here it's always on the "to buy list"! What can I say I have two little ones who love to wash their hands....ALOT!! So finding a great deal on it is a must!! Well, starting tomorrow, CVS has Softsoap (7.5 oz pump) on sale for just $.88. There is a $.35/1 printable coupon here (Click the icon in the bottom right hand corner). After coupon pay just $.53 for it!! What a deal!! There is a print limit of one coupon per household. The sale at CVS runs thru next Saturday 2/27/2010. Printable: Save 20% Off at Big Lots!! New: Pampers Gifts To Grow Code!!! Have a Back Yard Burger Nearby? Green Works Deal at Wegmans!!! Olay Facial Cleanser...For Less Than a Buck!!! PopChips Coupon....When You Become a Fan!! Save 15-20% Off at Walgreens...Tomorrow Only!!! How About 30% Off at Kohl's??? IKEA: Kids Eat Free This Weekend! Printables: Save on Kellogg's Cereals!! Save at Half Price Books...This Weekend Only!! Save on Meat at Giant!! The Turtle Story Giveaway Winner!! Girls Car Seat Deal: Need an Extra, Perhaps? Try On a Pair of Shoes...Get $20 Off!!! Remember The Little Golden Books? Try Your Chance at Free Milk 4 a Year!!! Free Building Fun For You & Your Little One!! Have an Old Country Buffet Nearby?